The Luxury Senior Suites comprise of one master bedroom with en suite bathroom and separate living room with tea and coffee facilities. 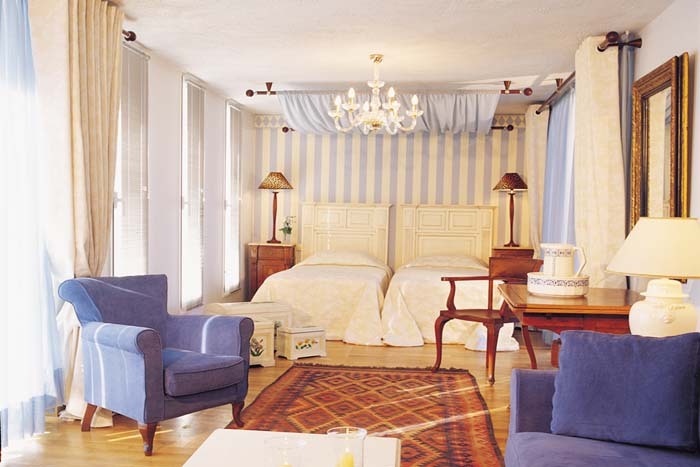 The suites are uniquely and beautifully decorated. All rooms feature marble bathrooms with separate shower cabin from bathtub with hydro massage, air conditioning, safe, satellite TV, DVD, CD player, private telephone line and high speed internet access. All suites have either a balcony or terrace, a garden or sea view and are close to the main pool which has a Jacuzzi and a children’s pool. The Family Suites have the same characteristics as the Senior Suites but they consist of two master bedrooms with en suite bathrooms. 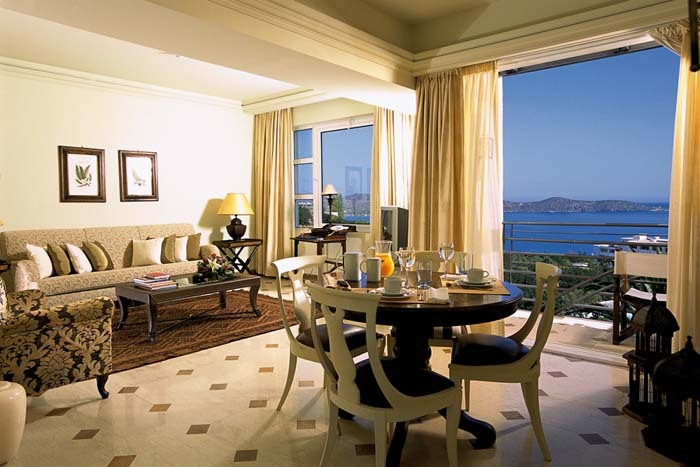 All the Family Suites have balconies with beautiful sea views. They are a perfect choice for families or a group of friends. 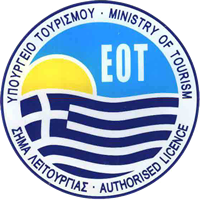 Elounda Villa (max. 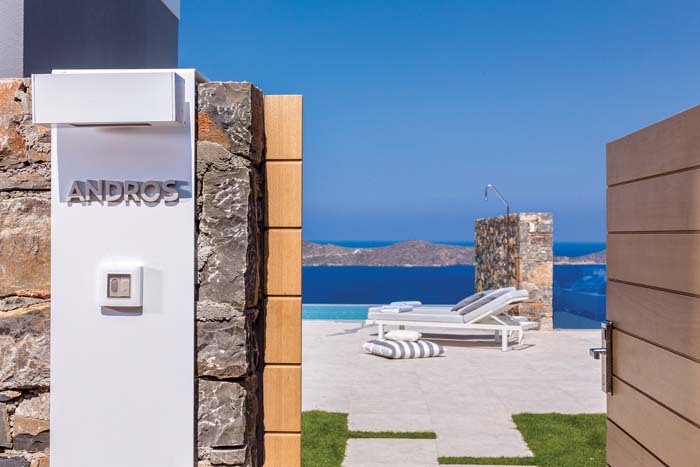 capacity 4 guests) Elounda Villa consists of a spacious living room with a fireplace, an open plan fully fitted kitchen, two bedrooms, two marble bathrooms with air-bath, safe satellite TV, CD and DVD player, air conditioning, private telephone line and high speed internet access. In addition, they have a private terrace with a magnificent sea view, a large saltwater swimming pool with a Jacuzzi and wooden sun beds. 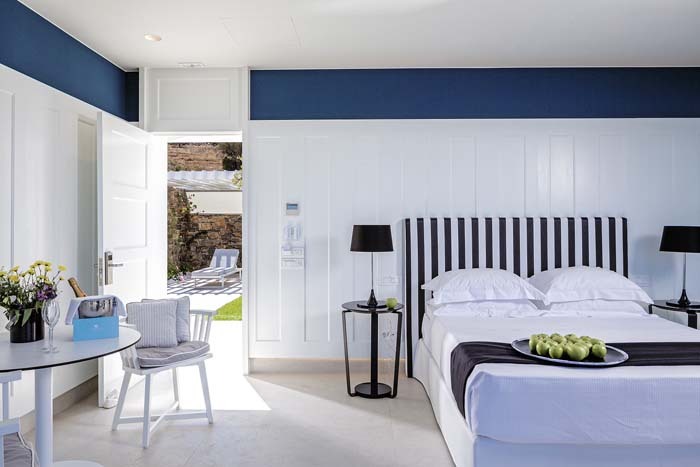 The Aegean Villas offer the same characteristics as the Elounda Villas but they consist of one master bedroom with en suite marble bathroom plus two more bedrooms which share a bathroom. All bathrooms have air baths and hand painted ceilings. 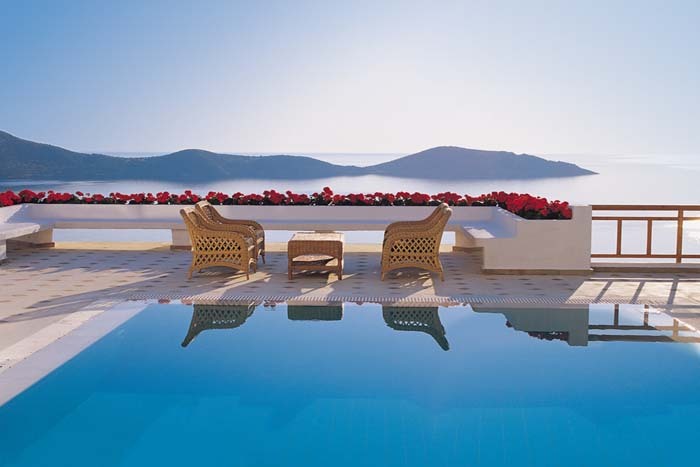 Each of the Aegean Villas sits on the hillside and overlooks the beautiful Mirabello Gulf. 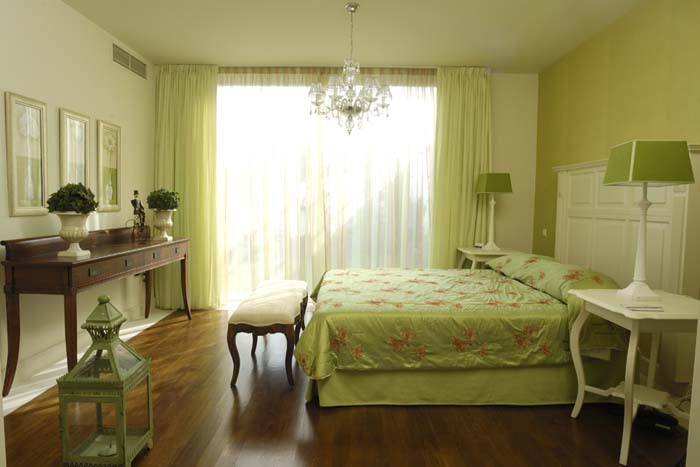 Rooms are stylishly decorate in warm or vibrant colours and have fine textiles and unique pieces of furniture. 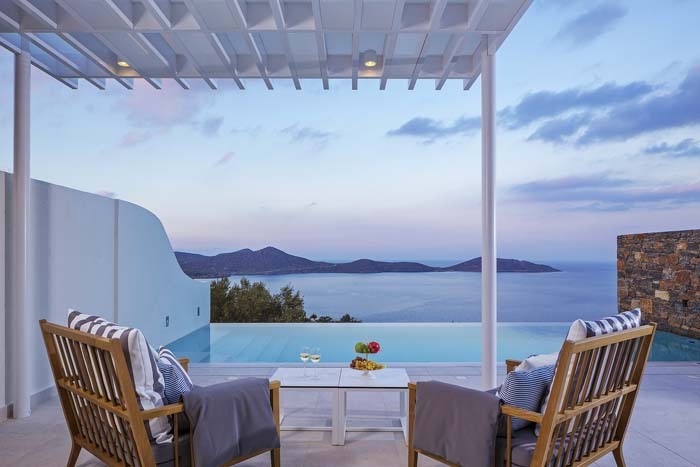 The Mediterranean Villas have the same characteristics as the Elounda and the Aegean Villas but feature three master bedrooms with en suite marble bathrooms all of which have hand painted ceilings and air baths. 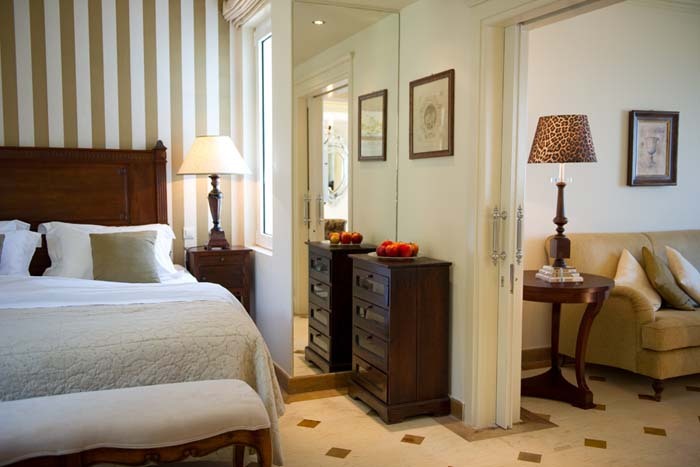 Each villa is elegantly decorated and ensures a relaxing atmosphere for guest’s recreation. As the Executive Spa Villas which are described below but with one master bedroom with en suite bathroom. These two have also a unique decoration as all the Villas and offer all the facilities to ensure comfort for its guests. 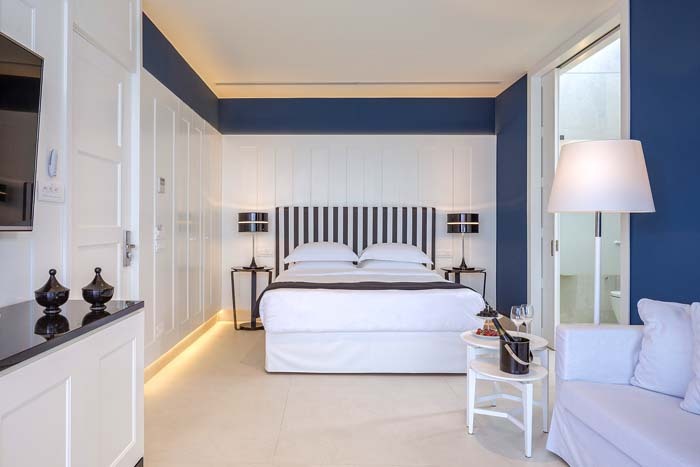 Executive Spa Villas are built on three levels connected by a lift and have a spacious living room with an open plan fully equipped kitchen and two master bedrooms. 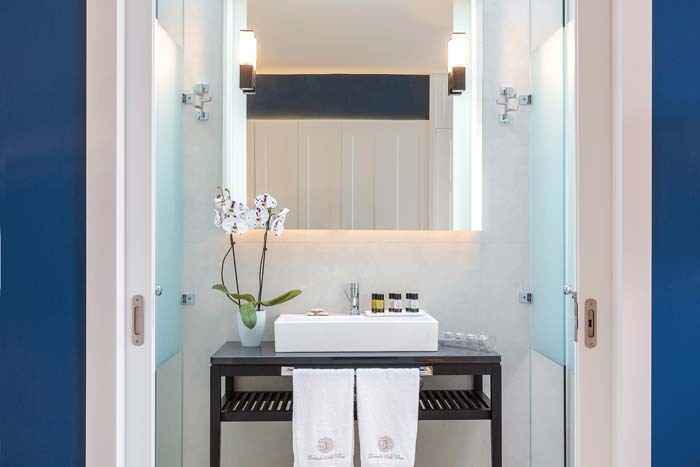 The two en-suite bathrooms are both made of marble and have hand painted ceilings while each offers a separate shower from bathtub and air-bath. The Villas offer air-conditioning, Satellite TV, DVD and CD-player, safe, private telephone line and high speed internet access. 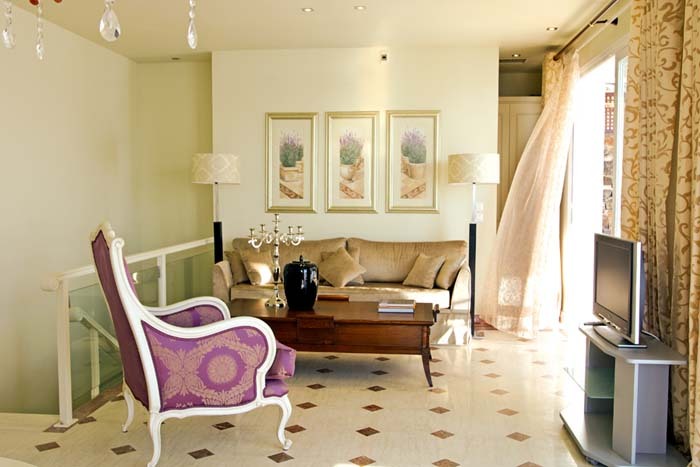 A private spacious marble terrace with wooden sun beds, a dining table and sofa are also provided. 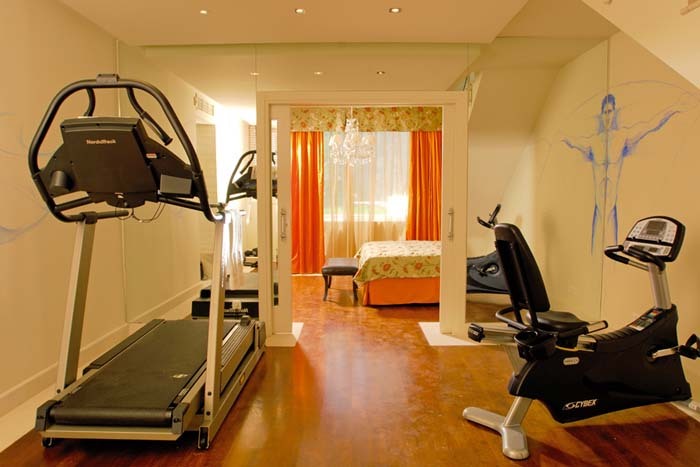 In addition to the above, the Villas offer their own private fully equipped gym room, sauna and steam bath. Finally there is a large, seawater, outdoor, (heated on request) pool with a Jacuzzi and a jet for swimming against the stream. 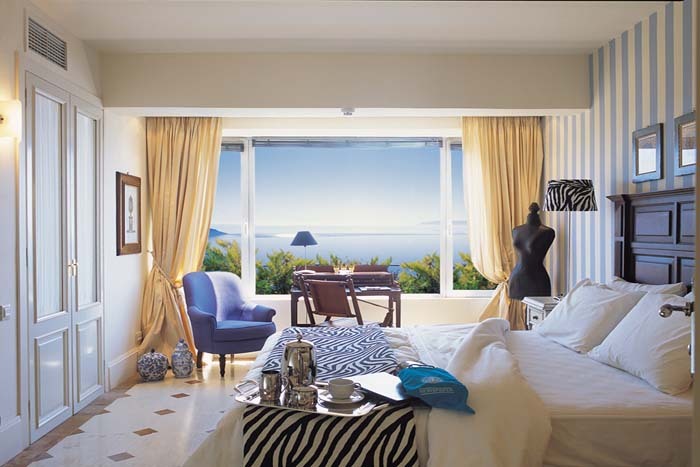 The sea views over the Gulf of Mirabello are absolutely stunning. 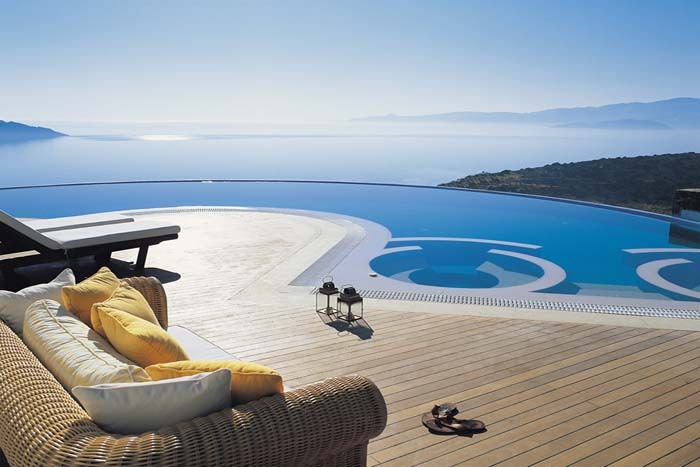 The two Presidential Villas “Minos” and “Ariadne” offer breathtaking` sea views over the Gulf of Mirabello. 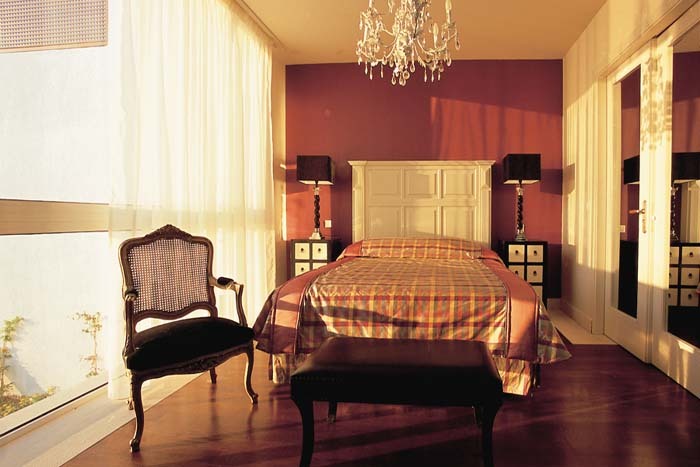 They consist of three master bedrooms with en suite bathrooms. 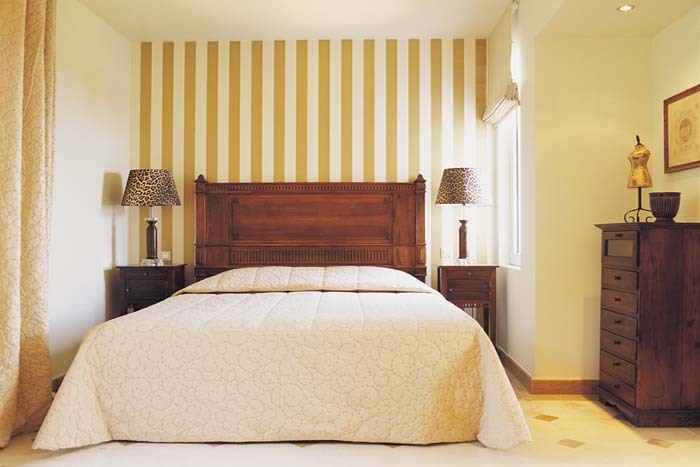 The bedrooms are spacious and individually decorated using soft colors creating a warm and comfortable atmosphere whereas some have separate dressing areas. 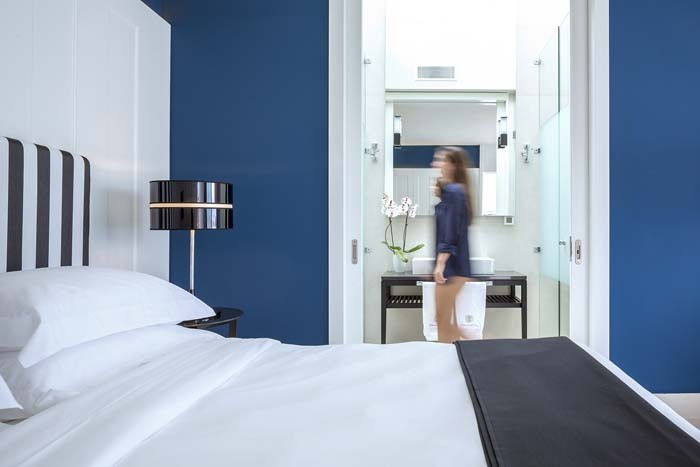 Details such as king-size/big single beds, 100% fine cotton bed linen and allergy proof pillows will satisfy even the most demanding guest. Bathrooms are spacious and luxurious, made of polished Greek marble and have stunning hand painted ceilings. 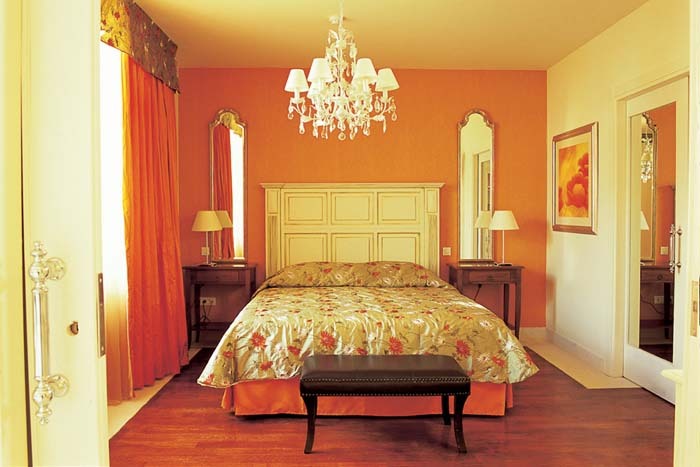 All have Jacuzzi tubs, hairdryer and make-up mirror while luxurious bathrobes, slippers and toiletries are provided. 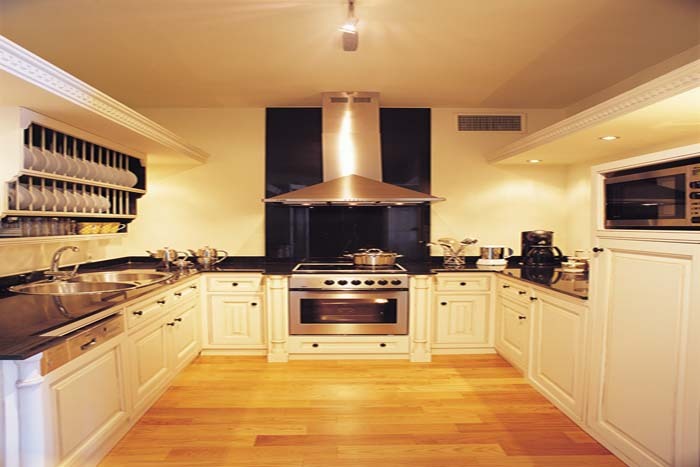 Kitchens are very modern and fully equipped providing four-ring cooker with oven, microwave, toaster, filter coffee machine, kettle, electronic citrus fruit squeezer, large refrigerator and dishwasher. Details such as porcelain plates are evidence of the ultimate combination of luxury and warmth of home in mind. Living rooms are made of soft and soothing colors, which combined with cozy, and real working wooden fireplaces create a warm and comfortable atmosphere. In addition to all the above the Presidential Spa Villas have their own fully equipped gym room for those that like to work out as well as sauna and steam bath for unwinding and relaxing after a long day in the sun. The unique Royal Spa Villa offers the epitome of luxury. 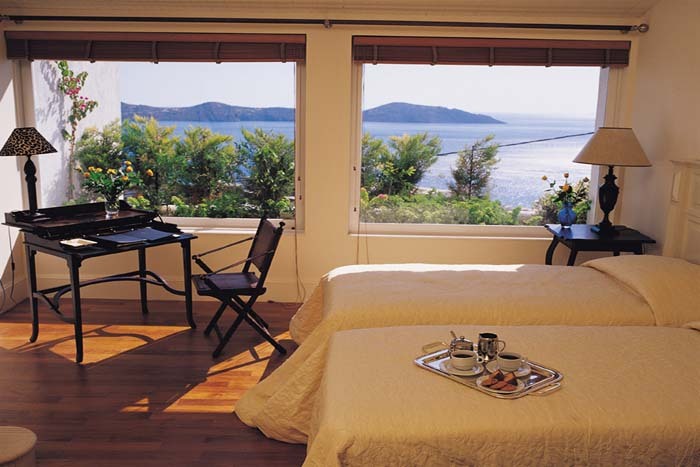 This spacious deluxe four master bedroom villa offers total privacy and panoramic views of the coastline and sea. It has its own private access with a parking area. The entrance in on the top floor and the four bedrooms and bathrooms are on the lower level. The grounds and large terrace with a BBQ overlook the outdoor, heated, crescent shaped, infinity pool (17,5x4,3m/ 1-1.8 depth) with its two inbuilt Jacuzzi tubs. The spacious open plan lounge with working fireplace and dining area offer comfort, style and elegance. 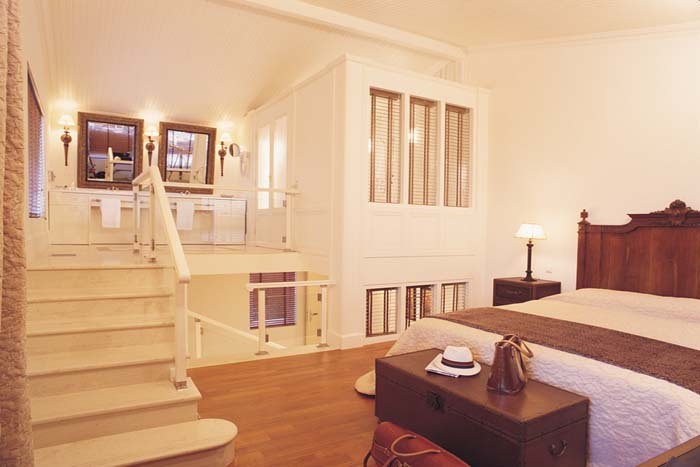 Downstairs are the four master bedrooms two of which offer king size double beds and the other two twin beds.each bedroom has its own whirlpool and steam bath. 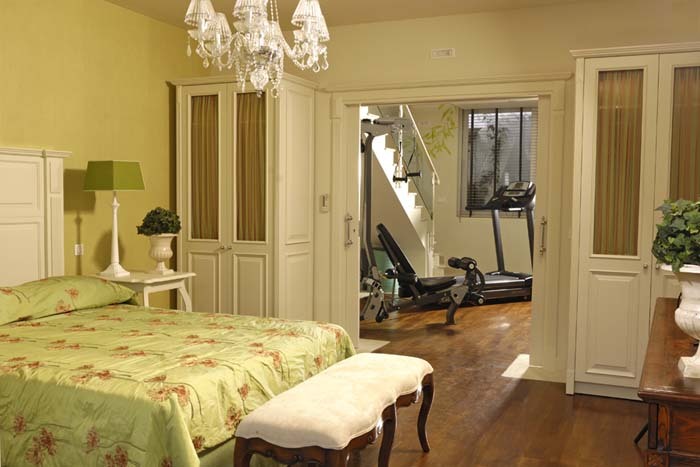 The Royal Spa Villa has also its own sauna, steam bath and private gym . The Royal Spa Villa has been featured several times within the “Top Properties” lists of national and international magazines and newspapers. 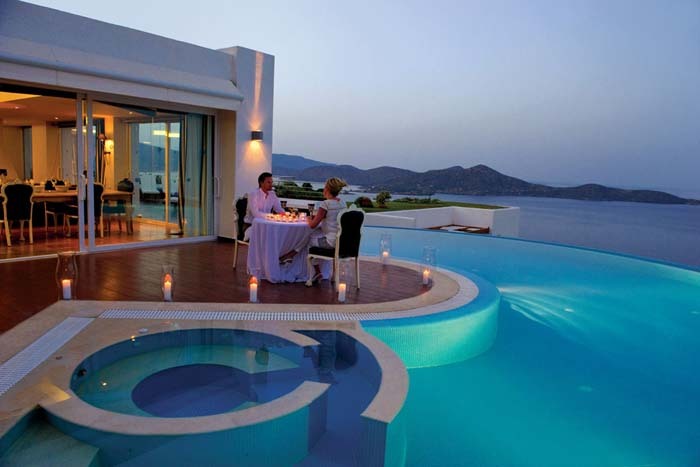 Unique culinary delights await guests staying at the luxury sea view Elounda Gulf Villas & Suites in Crete Island, Greece. The Argo a la carte hotel restaurant in Crete and the Daphni gourmet sea view restaurant near the beach of Elounda offer creations of exquisite gourmet cuisine in Crete with an extensive selection of Mediterranean dishes coupled with a variety of different international cuisine flavors to please even the most demanding customers. 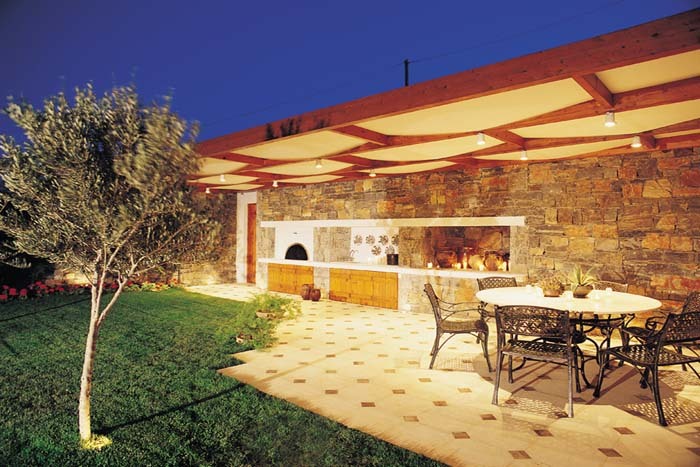 Guests can enjoy a fine dining experience in an award winning restaurant in Crete. In addition, special theme nights with Greek specialties and dances, elegant gala dinners as well as barbeque nights and intimate candlelight dinners with a personal chef and in villa privacy can be arranged for the guests’ further convenience. 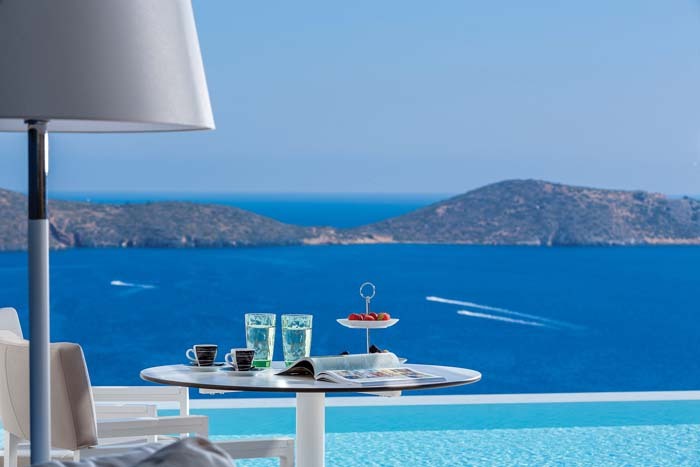 The hotel’s clientele can relax and revel in the flavors of Mediterranean cuisine specialties and exotic creations inspired by the International cuisine at an award winning restaurant in Crete Island, Greece. 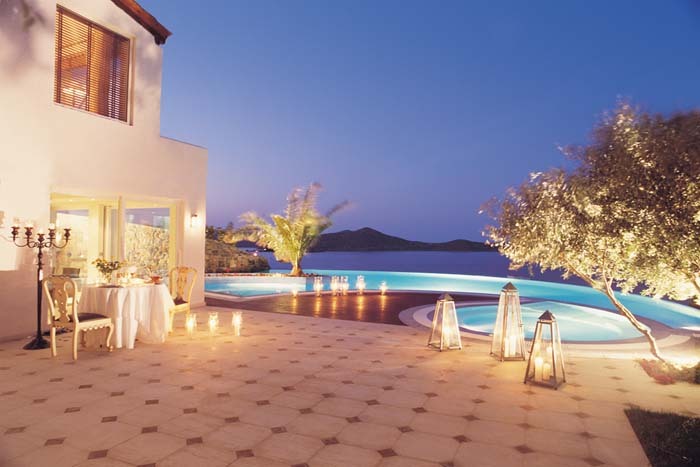 Both exceptional hotel restaurants in Crete along with the hotel’s relaxing lounge bar offer an elegant atmosphere complimented by exceptional cuisine, superior service and fine gourmet dining options in Crete Island. 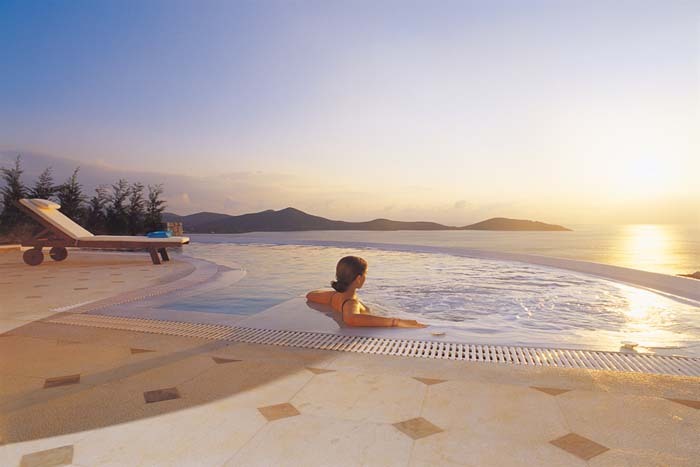 All elite guests have the opportunity to relax, swim and sunbathe at the Private Beach Club! 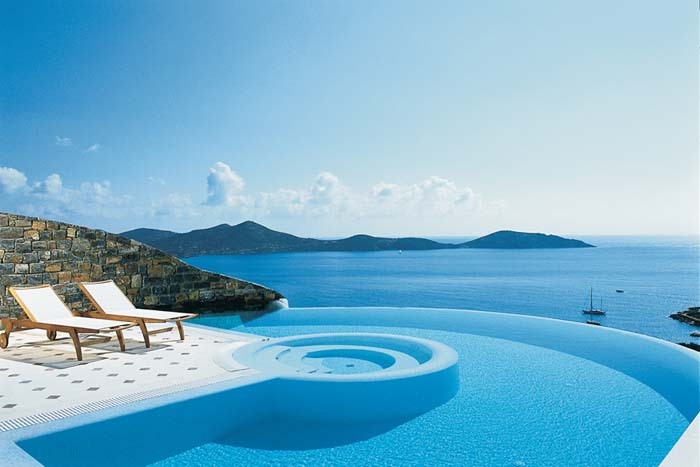 The EGV Private Beach Club is equipped with sun beds, luxurious sunshades and plush beach towels. Attentive service offers refreshing cocktails, drinks and fresh fruits throughout the day. Located less than 5min drive from the Elounda Gulf Villas & Suites, the hotel offers to all guests daily shuttle services to the private beach. Water sports and other beach services are offered upon request. Private events, parties, weddings and exclusive celebrations can be arranged at the private beach upon request. Entry to the private beach is allowed only to the hotel’s guests, and therefore privacy and ultimate serenity are guaranteed. 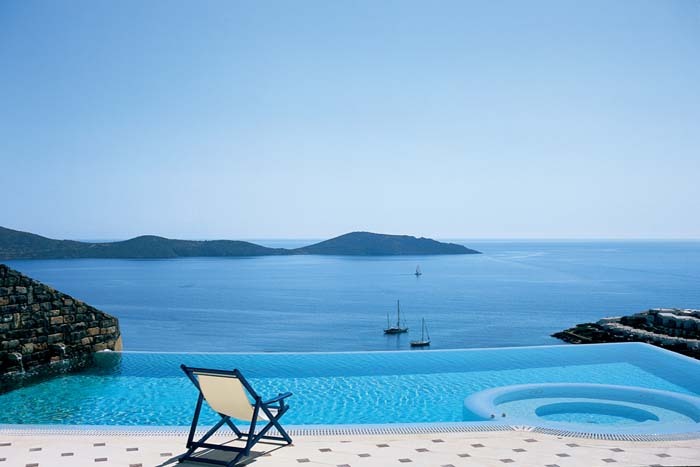 Beautifully embedded in the picturesque landscape Elounda Gulf Villas Hotel in Crete offers the perfect getaway from the hustle and bustle of everyday life. 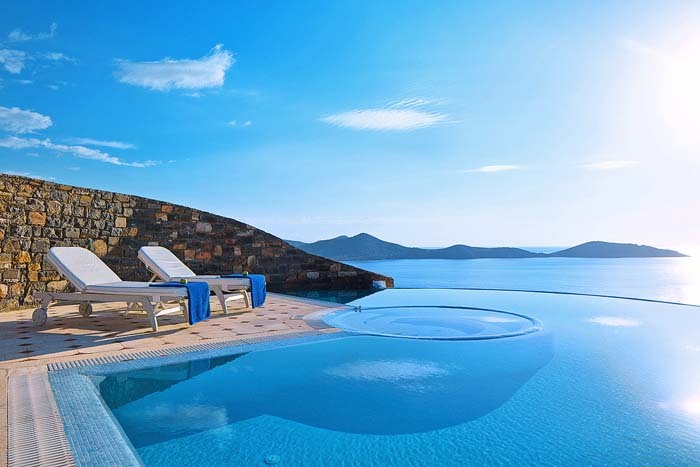 Ideally set next to the strikingly beautiful beach of Elounda in Crete Island, Greece this luxury boutique Villa-Hotel ensures absolute relaxation and provides an ideal setting for a luxury spa break and rejuvenating spa holidays in Crete. The hotel’s Elixir Spa Gallery is a realm of harmony, relaxation and well being where guests can use the soothing sauna and steam bath, the stimulating outdoor Jacuzzi and the fully equipped gym room and/or receive a full body spa relaxing massage treatments and spa therapies. 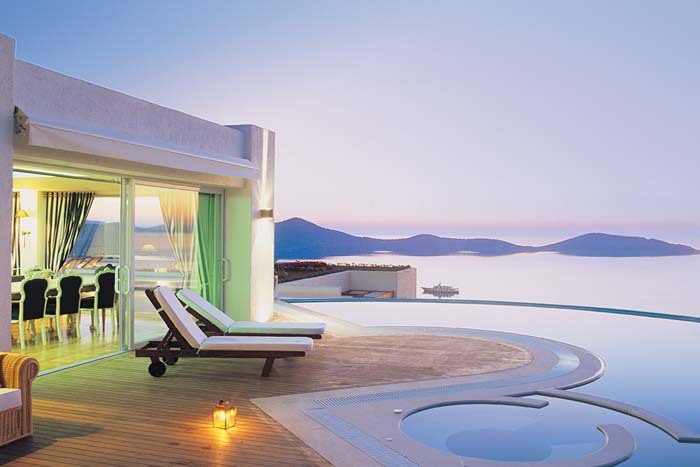 Massages and various beauty treatments can also take place at the privacy of the guests` suite or villa.